There is a definite seasonality to the oil and gas stocks in Canada—and generally speaking, the top is right now. 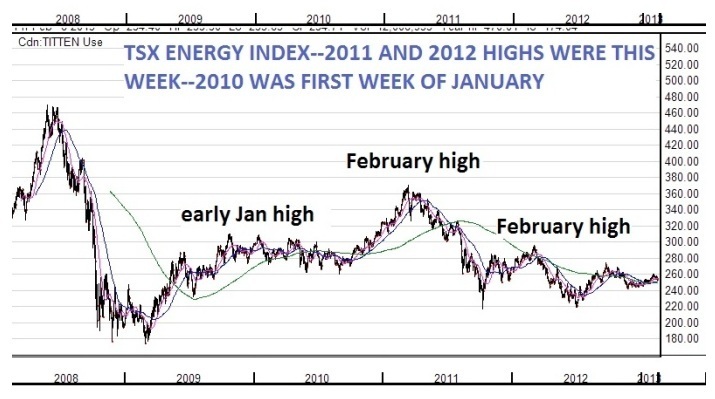 In both 2011 and 2012, the TSX Energy Index peaked out the first week of February. In 2010 it was the first week of January. Each of the last two years, the March-June timeframe gave investors serious downturns—the juniors as a group dropped by roughly 50%. It’s tough (for me anyway) to hold stocks in those kinds of corrections. It’s my job to help subscribers find the best ways to make money in oil and gas. Sometimes it’s the junior producers, which have given me some great wins—DeeThree and Coastal Energy now, and TAG Oil last year. That’s sometimes–but now is not that time. Despite strong oil prices, Canadian junior producers are getting no love from Big Money—institutions. Part of the reason is the big discounts the producers are being forced into due to lack of pipelines (for heavy oil) and refineries (for light oil). Another big part of the reason is that the market now understands the tight oil plays don’t recycle cash fast enough for juniors—only a very few management teams are able to do that, and NOT have to go to market for dilutive financings every year. Natural gas prices continue to languish, and Natural Gas Liquids pricing has also gone way down (except for condensate). Also, oil is now in what I call the “no-win” price range for junior producers. The stocks of these juniors do the best when oil is at the BOTTOM of its trading range—usually around WTI $75-$85/barrel. Then traders know a rising tide will lift all boats, and the junior stocks get love—and bids. But now, Brent oil is $119/bbl and WTI is just over $97. Since 2008, history is clear: oil juniors have an INVERSE relationship with oil prices when Brent gets above $120/bbl. That’s because the market starts to price in lower global growth, if not outright recession. And one of the first things the market does then is sell the riskiest assets; i.e. junior stocks of all kind. So at $120 Brent, it’s hard for investors in junior stocks to win—if oil goes up, these stocks go down as the market prices in recession. If oil goes down, these stocks go down, as the market prices in lower cash flow. What this really means for me right now is that—I’m much more likely to sell any junior that I don’t LOVE, in the near term. Or at least reduce it. And if it’s got a good chart, I’ll keep it. But make no mistake, even my favourites are vulnerable. If a stock chart cracks more than 20% off its recent highs, I’m likely a seller and I wait on the sidelines. I read a stat once that stuck with me—80% of all stocks trade with the market; they go up and down with the tide. And while the tide might be coming into equities now, they don’t appear to be moving into junior oil stocks. That’s why I’m moving into stocks that process commodities—water, oil and ethanol for example—to make money in the energy space in 2013. There is always a bull market somewhere in energy, and that is especially true in the energy markets. In September 2012 I started buying select US refinery stocks, and it has become the biggest part of my OGIB subscriber portfolio. They get to buy low-priced Canadian oil, and my attitude is—don’t get mad, get even. Buy the refinery stocks. As I explained in my September article, The Mystery Behind High North American Gas Prices, these companies get to buy cheap North American crude and sell their refined products at much higher Brent-based pricing—which is still $20/barrel higher right now than WTI, despite the Seaway pipeline expansion. I also talked about this on FOX-TV in the US — you can see that on the OGIB web site’s Media page, video # 2. It’s not just refineries. It’s also logistics companies, oilsands services companies, water companies, and others. But it’s the refineries that are cash machines right now, and that’s where I want my money. There’s one I think will benefit more than any other — because of its unique location, its high cash flow and dividend, and because it’s a well-diversified business. Keep reading here for more on this cash-churning play.